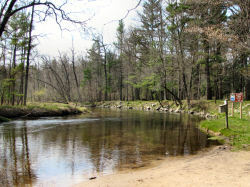 Gleason's Landing provides access to the Pere Marquette River from the east side. The area is popular with anglers and paddlers. Several primitive campsites are nicely spaced for privacy, and there is a separate picnic area. Boat Launch- Dirt ramp to the river. Although the North Country Trail is just on the other side of the river, up an old road spur from the water's edge, you cannot access it unless you cross the river somehow. However, if you had a boat at the site, you could cross and tie up on the opposite bank for a day. It's easy to find the old benched trail up the bluff, and the North Country Trail is right at the top of the hill. Gleason's Landing- From Baldwin, turn west on 7th St, go 5 blocks to the end and turn left. In one block make a right on Carr Road which becomes 52nd St. The road will jog south and become 56th St. Before crossing Bowman Bridge over the PM River, turn southeast on dirt 60th St. This curves around, and in about one mile turn south on Brooks Rd. Gleason's Landing is at the end of the road. Your non-profit outdoor organization could be here for just $1 a year!